Bhutas are divine beings mentioned in Hindu Puranas. In Hindu religion, some people mistake Bhutas as ghosts but they are not ghosts. Brahmanda Purana states that Shiva as Nilalohita Rudra created Bhuta. This happened after Sati’s death. Rudra Shiva created Bhutas in Sati but resembling Nilalohita form. Shiva as Rudra controls the Bhutas. The leader of Bhutas is Ganapati. It Matsya Purana, it is Nandi who is the leader and in Vamana Purana it is Veerabhadra who is the leader. 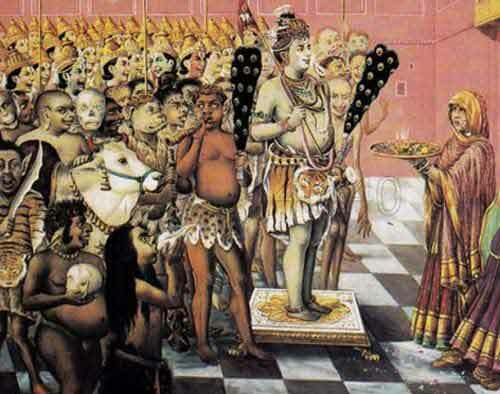 Vamana Purana states that there are 110 million Bhutas. Bhutas have lean body, fat protruding and hanging lips, long ears, red eyes, sharp and long teeth, long nails, pointed and big eyebrows and the body color is blue. They wear snakes across the body as sacred thread – poonol or Janai. Bhutas are experts in using Trident (Trishul), bow, sword, etc. They do not like music. They have fought along with Devas in many battles against demons. In folklore and rural traditions, Bhutas have numerous magical powers and they guard treasures. Bhutas are also worshipped in many temples as subsidiary deities. They are also assigned special place in traditional family worship especially in South India.